I am writing to you today on behalf of my loving husband, Eddie Beatrice. Eddie is the wonderful father of our children Steven and Christina and good friend to many. Due to severe complications following routine surgery in October of 2011, Eddie suffered from end stage renal failure and was told that he needed a life-saving kidney transplant. I am thrilled to tell you that Eddie has received his life-saving kidney transplant because of a very generous living donor, Dr. Kelly Wright. This past January, Eddie began searching for a living donor. 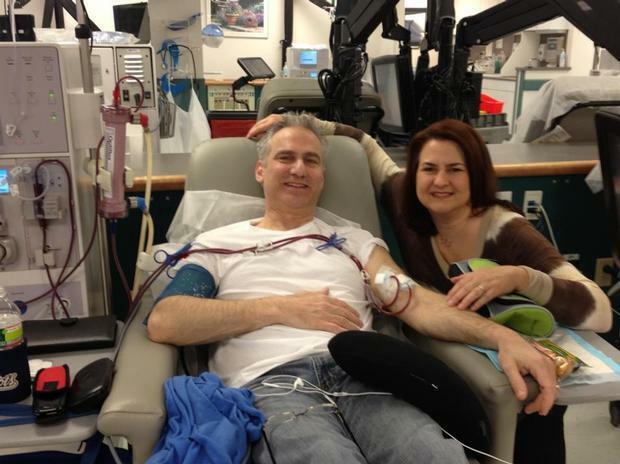 Thru the National Kidney Donor Network, Kelly had offered to donate a kidney to an anonymous recipient. Within 3 months of connecting, Kelly was determined to be a match and the surgery date was set for April 2nd. Kelly, who lives in California, is a loving wife and wonderful mother of two beautiful children. She and her husband Gerry own and operate a full service veterinary medical center and boarding facility for cats. She is an accomplished triathlon competitor and is known to be a dedicated and determined person who accomplishes anything she sets her mind to. Eddie and Kelly are both doing well and would like to encourage all of you to consider becoming an organ donor. Eddie and his family are incredibly grateful and humbled by the generous act of Kelly. Eddie is getting stronger each day and hopes to return to work as soon as he is able. As you can imagine, Eddie’s strenuous journey has led to staggering medical bills. Even with insurance there are many expenses that must be paid out of pocket. Some of these are deductibles, co-pays for follow-up appointments, travel and relocation expenses for Kelly and Eddie will be on a life-time of anti-rejection medications. Because of this, we must continue to rely on those with giving and caring hearts. To help with some of these uninsured expenses, a fundraising campaign in Eddie’s honor has been established with HelpHOPELive, a nonprofit organization that has been assisting the transplant community for 30 years. All contributions are tax-deductible, are held by HelpHOPELive in the Northeast Kidney Transplant Fund, and are administered by HelpHOPELive for transplant-related expenses only. When considering your donation, please think of Kelly’s generosity.On behalf of Eddie, Steven and Christina, I thank you for your kindness, generosity and support. Thank you to EVERYONE for your kind words, prayers, generosity, friendship, support and love. I am truly blessed. It's no accident we crossed paths, you're an inspiration and reminded me of all that I have been through with my own health. Sometimes it takes something like this to provide us with a perspective on how precious life truly is and show us how a loving and caring support system restores our faith in humanity. (A blessing in disguise?) "There is one consolation in being sick; and that is the possibility that you may recover to a better state than you were ever in before." ~ Henry David Thoreau I wish I could do more as well as make it to O'brien's tonight, but know I have nothing but best wishes for a happy and healthy future for you Eddie & your Family. Peace and Strength. Hugs and Kisses. A little help is better than none Wish I could do more! Maybe if I win the Powerball!